Today, we have exclusive discounts on must-have kitchenware to indulge your inner chef. 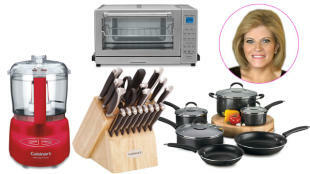 Picked exclusively for "GMA" viewers, this large selection of must-have kitchenware will indulge your inner chef. Featuring top brands like Cuisinart, 10 Strawberry Street and Simply White, there is a wide variety of options to choose from, including a 42-piece dinner set, 10-piece non-stick cookware set, 19-piece knife set and convection toaster oven broiler. Each piece is a great addition to your existing collection or perfect for starting a new one. Free shipping!